Air pollution is often discussed in the media — but comparatively few people know that parts of the Netherlands, especially larger cities like Amsterdam, break emissions targets. Even fewer people understand what these pollutants are and how they can be harmful. Our international editor Alex Stargazer explains. Air pollution is complicated. Beyond the alarmist headlines runs a complex —but no less disturbing — reality. My aim here is to explain what air pollution is, where it comes from, what consequences it has, and of course, how we can go about reducing it. The dawn of the Industrial Revolution saw the widespread impact of anthropogenic (man made) pollution. In the 19th century, the two big bugaboos were sulfur dioxide (SO2) and large particulate matter (PM). These pollutants were bad, but they had one saving grace: they were visible. 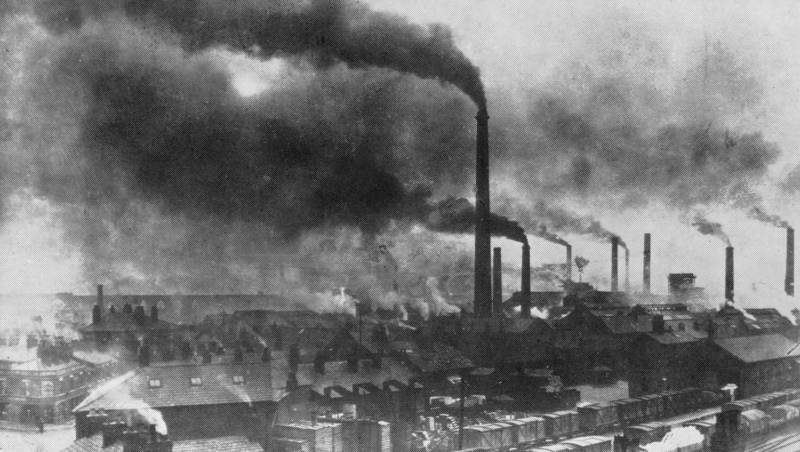 Photograph of Widnes in the late 19th century showing the effects of industrial pollution. Photo: Hardie, D. W. F., A History of the Chemical Industry in Widnes, Imperial Chemical Industries Limited, 1950. Today, however, pollution is more covert. The developed world, in particular, is struggling with two pollutants: those of NOx, and fine particulate matter. The former occurs when the normally nonreactive nitrogen — which makes up three quarters of the air we breathe — is bound to oxygen in high-pressure and high-temperature environments. The latter is like a kind of soot, only microscopic (less than 2.5 microns) in size. Neither can be seen with the naked eye. The phrase “if I can’t see it, it can’t hurt me” comes to mind — as a lie. In fact, NOx forms toxic byproducts in the atmosphere, including ozone, and these have serious consequences for heart and lung health, leading tens of thousands of increased deaths. As for fine particulate matter, it is actually worse for human health than the archetypal 19th century smog; in fact, the WHO shows that even in the EU — where levels are comparatively low — it contributes to an estimated 9 months reduction in lifespan. But where do these pollutants come from, and what can do we do to reduce them? Nitrogen oxides usually form in the inside of a diesel engine, or a combustion room in a coal power plant. Diesel is already infamous; less well-known is the three new coal power plants the Dutch government approved. As for particulate matter, that can also be formed in diesel engines, and —surprisingly — by brake and tyre wear. Because of this, traffic is a significant component in air pollution emissions. It’s also why Amsterdam exceeds WHO recommendations on fine particulates by 80 percent. It’s not as if the Netherlands hasn’t tried to tackle the problem. Bicycling has been Dutch government policy since the 1970s. The Amsterdam tram network runs on renewable electricity. But these efforts have been let down by one, crucial weakness: the scooter. Relative to the amount of fuel it burns, a scooter produces hundreds or even thousands of times more pollutants, including fine particulates and NOx. But scooters also emit certain pollutants that other vehicles do not. Volatile organic compounds — which are usually associated with burning wood in developing countries — are actually released by the uncounted thousands of scooters right here in Amsterdam. The EU has brought in increasingly tight emissions standards, first with Euro 3 and now Euro 4 legislation. Unfortunately, Euro 4 will only apply for mopeds sold this year. Many mopeds on the streets are older, and thus polluting. In conclusion, what we have learned is that air pollution is harmful; it exceeds EU and WHO limits; and that a serious effort to reduce it will require tough action. This means no more coal power plants, and perhaps even shutting down the new ones. It means more electrification in cars — or abandoning cars altogether, since even the brakes contribute to pollution. And in the case of Amsterdam, I see two things as necessary: firstly, reduced fares and increased coverage by the tram network, and secondly, a crackdown on mopeds. It’s time to embrace the future, fight pollution, and give stinky scooters the boot. Geplaatst in Duurzaamheid, International (EN) en gekoppeld aan air, Amsterdam, cars, coal, EU, Netherlands, pollution, power plants, scooters. Maak een bladwijzer van de permalink. Wordt nu iedere zomer een Sportzomer?